Conveying any material that can be moved in an airflow including grain, plastic pellets, sawdust, powder, capsules, metal chips, paper and cloth trim, lint, dust, small parts, stamping scrap and lead shot. 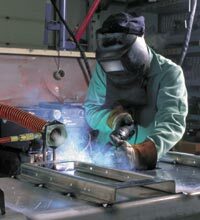 Ventilating and exhausting welding, soldering and machine smoke, auto exhaust, plating tank fumes and other gases. Cooling molded parts, castings, etc. 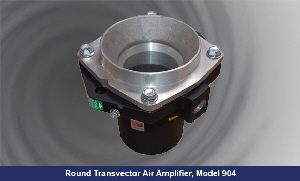 Round Transvectors are used in both ducted and unducted applications. In ducted applications, they are used at flow rates up to 2400 SCFM (67920 SLPM). 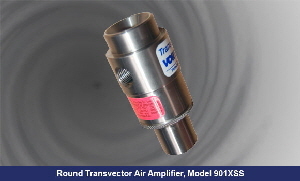 Transvectors are excellent for ventilating, air conveying, drying and cooling. are high flow “bladeless blowers” that do not require machine guards and are inexpensive, small, light weight and easy to install. Using only a small amount of compressed air as a power source, you can move large volumes of air with Transvector products. 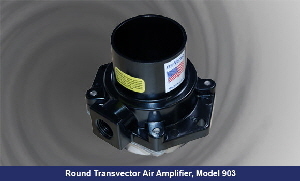 An airflow amplifier, a Transvector increases airflow using an energy transfer process that induces motion in the free, surrounding air. 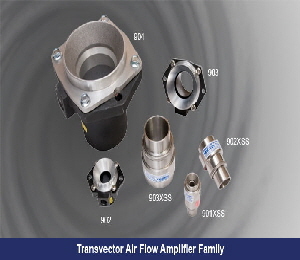 Amplification ratios up to 60 times greater than the compressed air consumption enables Transvectors to deliver an increased airflow while drastically reducing compressed air consumption and noise levels. Capable of ducted flows to 2400 CFM, Transvectors may be used ducted or unducted. 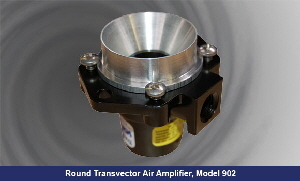 An air line pressure regulator controls a Transvector’s output by adjusting input. Excellent for ventilating, air conveying, drying and cooling, Transvectors use no electricity, have no moving parts, and meet OSHA noise specifications. 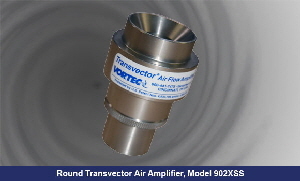 The Transvector uses an impulse principle to accelerate a large mass of stationary air with a thin sheet of sonic velocity air. 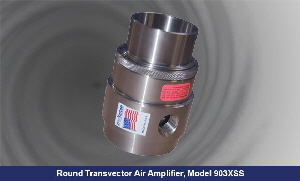 When compressed air enters the Transvector, it fills a chamber which has only one exit path: an annular orifice 0.002” wide. As the air passes through this orifice, it accelerates to 1000 FPS. A lip on the orifice deflects the compressed air down the throat of the Transvector, where it collides with surrounding air and accelerates great masses of free air toward the outlet. It is a simple energy transfer process, similar to a break in a pool game. A few high speed particles of air collide with still air particles, resulting in a greater number of particles moving at moderate speed. The secret of the Transvector lies in its ability to maximize the speed of compressed air it releases. Energy released by the compressed air as it strikes the still air increases be the square of its velocity. * Conveying any material that can be moved in a rush of air: grain, plastic pellets, sawdust, powder, capsules, metal chips, paper and cloth trim, lint, dust, small parts, stamping scrap, lead shot, etc. Transvectors may be used either ducted or unducted. The basic amplification ratio is a measure of air amplification in a ducted installation. The entrainment ratio for unducted applications is three times greater because it takes into account the additional entrainment or air surrounding the output stream. The entrainment usually occurs a few feet within the Transvector’s outlet. Because of the water and dirt contaminants in most factory air systems, we recommend a five Micron filter in the compressed air line to prevent clogging of the annular orifice.